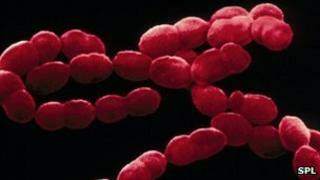 Image caption Streptococcus pneumoniae bacteria can cause pneumonia and meningitis. Some bacteria can evade efforts to vaccinate against them by wearing a new disguise, researchers say. A study, published in Nature Genetics, tracked how pneumococcus bacteria responded to the introduction of a vaccine in the US in 2000. Doctors said the evasion would make some vaccines less successful in the long term. An updated pneumococcus vaccine is already in use. Vaccines train the immune system to attack something unique to an infection. In the case of tetanus, it results in the body making antibodies which target the toxin produced. Dr Rory Bowden, one of the researchers from the University of Oxford, told the BBC: "There are plenty of vaccines out there that look stable and continue to work because they target bacteria or viruses that are not changing." Pneumococcus bacteria, however, comes in more than 90 varieties or serotypes. Each variety looks different to the immune system so would each need separate vaccines. Infection can result in pneumonia and meningitis. Across the globe, more than 800,000 children under five die as a result each year. A vaccine against more than 90 types would not be possible, but in 2000 the US authorities began immunising against seven of the most common varieties. Cases rapidly dropped. By 2007, there was a sustained 76% drop in cases of septicaemia, pneumonia and meningitis in children under five. However, some bacteria managed to change their outer coat - known as capsule switching - to avoid the immune response. They did it by collecting pieces of DNA from other pneumococcus bacteria which had died. By analysing bacterial genes, the researchers identified five cases of capsule switching. They said one of the new strains, called P1, "quickly became established spreading from east to west across the United States". It had "become one of the most prevalent" varieties by 2007, the report said. An updated vaccine which protects against 13 types has since been introduced. Dr Bowden said the "holy grail" would be a universal vaccine which would target something common to all types of pneumococcus. Prof Derrick Crook, from Oxford University Hospitals NHS Trust, said: "Understanding what makes a vaccine successful and what can cause it to fail is important. "Our work suggests that current strategies for developing new vaccines are largely effective but may not have long term effects that are as successful as hoped." Dr Bernard Beall, from the US Centers for Disease Control and Prevention, added: "The current vaccine strategy of targeting predominant pneumococcal serotypes is extremely effective, however our observations indicate that the organism will continue to adapt to this strategy with some measurable success." The Wellcome Trust's Dr Michael Dunn said: "New technologies allow us to rapidly sequence disease-causing organisms and see how they evolve. This will provide useful lessons for vaccine implementation strategies."